Two leading knitwear designers, who have created classic pieces for private collections and galleries for more than 20 years, present an eye-catching assortment of intarsia projects, perfect for gift giving. 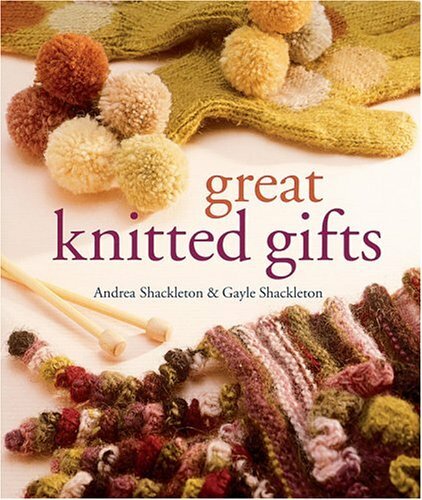 Handbags and gorgeous garments for adults, plus adorable doll clothes, hats, and sweaters for children--that's what knitters will find inside this remarkable collection of gifts to knit. They're made using intarsia, an easy-to-work two-color technique that's especially popular with a new generation of knitters. Each item features a pattern in bold geometrics, stripes, or florals, and all the designs are young and fresh and beautiful enough to qualify as wearable art. Choose a Circles Scarf and Hat with pom-poms, Cherry Blossom Mittens, a Ruffle-Edged Drawstring Bag, Big Squares Knee Socks, a Wee Striped Cardigan, and many more. Every project includes full-color graphs, which make following the design foolproof. Sisters Andrea and Gayle Shackleton have been designing and knitting sweaters by hand for nearly 20 years. Their company, Hot Knots, boasts a line of sweaters, dresses, accessories, and children's sweaters. Through their Tara designs, the Shackletons aid a nonprofit women's knitting cooperative in Nepal. The women there hand-dye the woolen yarns used in the designs and knit the items for the line.